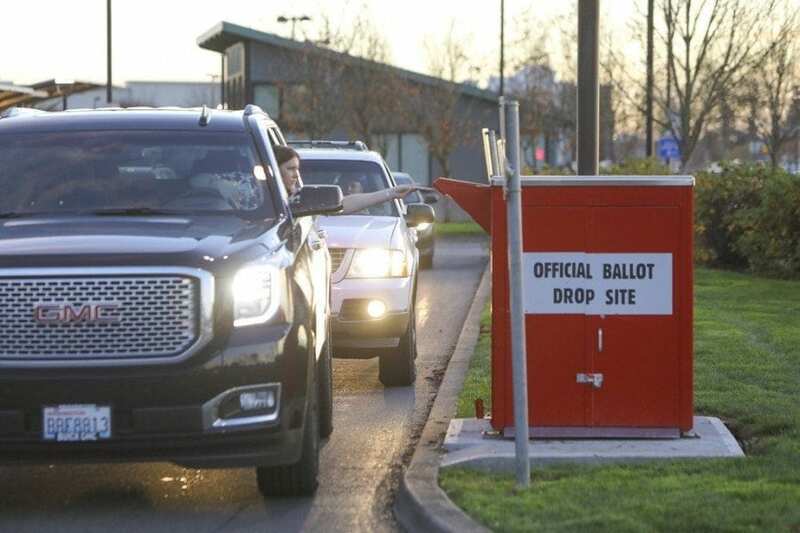 VANCOUVER — With only five days remaining until the Feb. 14 Special Election, which will determine the fate of bonds or levies in seven different Clark County school districts, fewer than one-fourth of eligible voters have turned in their ballots. 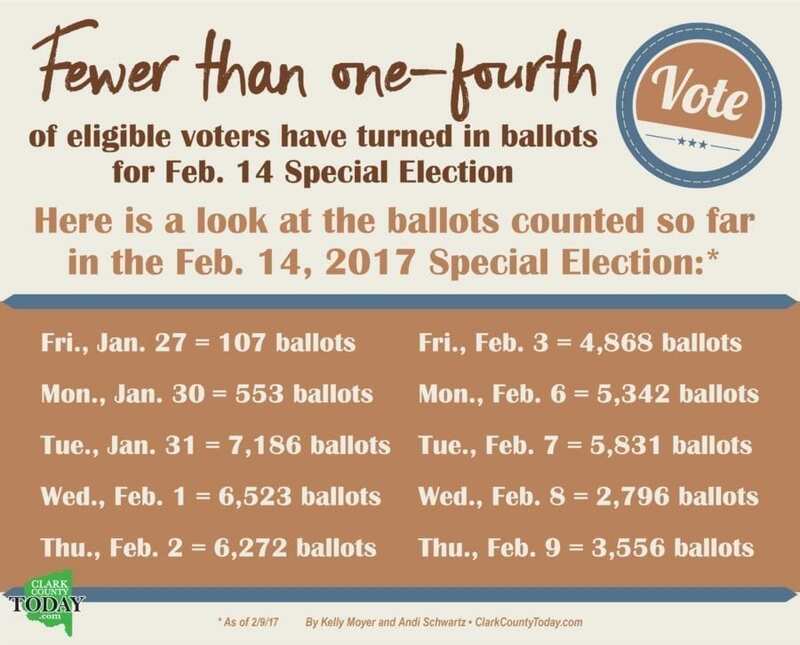 As of Thu., Feb. 9, the Clark County Elections Office had recorded a total of 43,034 returned ballots, or 23.5 percent of the total 183,042 eligible to vote in the Feb. 14 Special Election. Seven Clark County school districts are running bonds or levies in the election, including the Vancouver School District, which has asked voters to approve a 20-year, $458 million bond to replace several schools throughout Vancouver and the Ridgefield School District with its $78 million bond for school construction, renovation and replacement. Because they are asking voters to approve bonds, both the Vancouver and Ridgefield school districts need a supermajority to pass their measures. That means that 40 percent of the voters who turned out for the Nov. 8, 2016 General Election must cast votes in each district and 60 percent of those voters, plus one, must approve the bond measures. In Vancouver, this means that 26,996 voters need to return ballots and it will take 16,199 “yes” votes to pass the $458 million bond. The five school districts seeking approval for their new or replacement levies — Battle Ground, Camas, Hockinson, Washougal and Woodland — must have a simple majority with 50 percent or greater “yes” votes to pass their levy requests. Last year’s Feb. 9, 2016 Special Election also had seven Clark County school districts seeking bond or levy approval. In that election, a total of 64,045 out of 199,859 eligible voters — 32 percent — cast their votes. Of those 64,045 votes, nearly 20 percent of them came in on the actual election day. 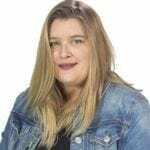 A special election held in February of 2015, which had just two school bonds on the ballot — for Hockinson School District and Washougal School District — saw greater voter turnout, with 40.5 percent of eligible voters, 6,673 out of 16,474, turning out. Ballots must be returned by mail need to be postmarked by Tue., Feb. 14. Voters can also drop their ballots off at the Clark County Elections Office at 1408 Franklin St., Vancouver, by 8 p.m. on Election Day or at one of the ballot deposit locations listed on the Clark County Elections Office website. There are six permanent, 24-hour, drop box locations in Clark County.